For some time now I’ve been beta-testing Joost, a TV service through the Internet, and it allows you to choose when to watch which program; basically, total control for the end user. Joost, which is supposed to be pronounced “juiced”, is an initiative by Niklas ZennstrÃƒÂ¶m and Janus Friis, the people behind the highly successful and great Skype service. All the content is “free”, so to speak, in the sense that it is only ad-sponsored. The ads, however, are only shown for a short while, so personally I never even notice them. The user interface consists of three major parts: My Channels (to the left), My Joost (to the right) and program information (at the top). If you click the program name at the top, an information overlay is put on top of the clip being played, showing basic information about the selected program. If you go into the My Channels view, you have a number of channels listed which you can watch. 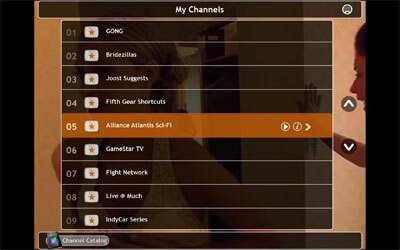 You can also add/remove channels, so it only consists of your favorite ones. If you choose a certain program in the list, you can get a listing of all the programs that that specific channel contain, and then choose the exact one you want to see at that time. Also offered is a Channel Catalog, where you can see suggestions for new channels to watch, browse through them based on popularity, staff picks, category or alphabetical order. A section for interacting with other users and adding your favorite widgets is the My Joost one. At the moment, not so many widgets are available, but I’m certain that this area will explode in the future. I think Joost is a great service, I really do! The interface is really nice, and it’s easy to find channels and watch what you want. One other thing that is so good about it is that it is legal, since I’m convinced most people want to do the right thing and not download pirate copies. It’s a perfect example of giving people what they want, to compete with illegal downloading, as opposed to some legislation witch-hunt, which will never succeed. There’s just one worry I have, and it is a major one that can put a halt to the entire idea. If you look at the Channel overview, you can see that a number of channels are only offered to certain geographical areas (something that I noticed when the National Geographic channel suddenly wasn’t available any more). This is so wrong! While I’m sure that US users won’t care (since most programs are offered to them), things like this is exactly what leads to the rest of the world throwing Joost out of the window and just go back to something like The Pirate Bay instead. I’m sure this is not based on what the Joost creators envision, but instead stubborn TV companies trying to retain control over something they don’t realize they’ve already lost. Internet is worldwide, remember? Hence, if the service isn’t, people won’t use it. Period. All in all, though, you can turn this around! Offer everything worldwide, and this is a service that really has the potential to change the way we view watching TV through the Internet, and decrease illegal downloading. Make the change before it’s too late! I have two invites to test out the great Joost beta service. Donate to any of the charities below (minimum donation: Ã‚Â£2) and I will send you an invite. First two people will get the invites. It's time that they get the big shows on there, worldwide. Otherwise people will lose interest and go back to their usual downloading routines. I'm also in Sweden and I'm frustrated with the fact that the quality channels seem to be restricted to a north american audience. I'm from China and feels Joost will not make an impact to my life. The most important reason is that the TVs on Joost are almost for Western audiences. Although I watch American TVs every week(Lost, Heroes), I get them from P2P software like emule. Besides, poor internet connection and geographical position are two other limitations. I've tried Joost, it has a better UI than the other P2P TV services I've used before. However, I find there are few channels I can watch and the lag makes a comfortable watching into a terrible experience. 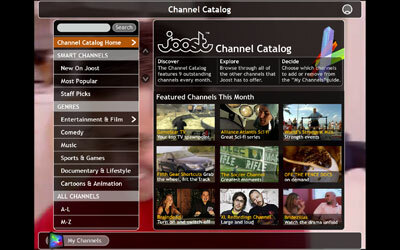 Even though, being a Joost beta tester already, I find the range of channels to be pretty limited. I mean, heck, I can even get better channels through WMP (MTV, CNN, Cartoon Network, ZTV and so forth). The iTunes store is a perfect example of regional offerings that alienate customers. It really annoys me that the UK store does not offer the same content and pricing as the US store, especially for TV shows. It's not like they are giving them away free, so why the Hell not sell them globally?!! I mean, if someone really wants to see the latest episodes of any popular TV show, they've only got to look to p2p or torrent and then the companies get nothing lol? It's really sad that there are restrictions on what different regions can watch; most disappointing. Joost looks interesting, and I might take you up on the beta, except next week is "Turn off TV" week. Our household is already planning activities sans TV. Not sure how I would fit it in this week. P.S. I donated yesterday to WWF. Hope others decide to join in! I heard a report about this on the radio this morning and thought Joost must be spelled that way. I was going to type that into my browser when I read your post. I wouldn't have got very far! Is it streaming only? That would be a big no for me. And there isn't some stream manager, is there? You would have to have a browser window/tab open to load each video? Annoying. I would have to be able to download and store the video on my hard drive, so that I can easily move it to an other computer — possibly one that isn't connected to the internet. Is there a show subscription function that downloads new episodes for you right away when they are available? Where are these ads placed? Before/after or are there breaks for them? I will never ever watch anything that breaks if I can get the same without too much trouble without breaks. At the moment tvrss.net and Ã‚ÂµTorrent works magic. New episodes downloaded and ready for viewing in nice quality before I wake up — or go to sleep in the morning. I don't expect anyone to come close with a legal option any time soon. Too many control freaks in control! I think there would have to be a show that reaches the magnitude of Heroes, 24, Lost or such by the means of global distribution through a bittorrent like technique before anyone can get out of the grip of the USA like distributors. And — hehe — "All the content is Ã¢â‚¬Å“freeÃ¢â‚¬Â, so to speak, in the sense that it is only ad-sponsored." Free as in free of charge is called gratis in english too — in quite a few languages, actually. Good to see that someone share my opinion. I definitely understand your problems, and it is very good to get input from somewhere where I don't know how it works. Yes, at the time it is fairly limited. Thanks for the donation, it was very appreciated! I sent an invite to you. Wow, that's a lot of questions! The quality is so-so, to be honest. I hope it will get better. Since it's streaming it automatically downloads the latest episodes. The ads are placed within the videos, or rather from, what I've seen, at the beggining (just as a regular TV commercial). So can somone please get me an invitation ? Sure, one invitation left, Please just donate to one of the charities linked from this web page, and I'll send it to you. i've been using joost for about a week now, from mexico city, and i haven't been ale to see a complete clip yet ('this program is unavailable right now'). I can at least start watching anything i click on, but the quality isn't too great and and it stutters a lot, and i never get to the end of any program before the 'unavailable' message shows up. So far it isn't really compelling hence, i am also curious about the bandwidth and storage it consumes, i'll do some measurements on that and post it. I hope the content limitations and streaming hiccups will be ironed out before a release, because in the current form it just doesn't cut it. Thanks for sharing, interesting to hear about your experience with it. I agree that at this time, the quality isn't really ready for prime time. I've just discovered another TV service, Zattoo, which is really nice and free. As far as I can tell, you can currently watch only European channels (there are about 30 of them at the time of writing). The interface is pretty straightforward: choose a channel, wait for a couple of seconds (buffering + advertising) and watch TV on yout computer.